The eldest son of Edward IV, whose person, at that king's death, was seized by his uncle Richard, Duke of Gloucester, younger brother of Edward IV. ; which act marks the beginning and the end of this unfortunate prince's career as successor to the throne at the age of twelve. In 1594, there was published in London, "The True Tragedie of Richard the Third; wherein is showne the death of Edward the Fourth; with the smothering of the two young Princes in the Tower; with a lamentable ende of Shore's wife, an example for all wicked women. And, lastly, the conjunction and joyning of the two Noble Houses, Lancaster and York. As was played by the Queenes Majesties Players." Not Shakespeare's tragedy, this, but another's. Its title tersely sums up the main historical incidents of Edward V.'s brief life of thirteen years. The two young princes were the brothers, Edward V. and Richard, Duke of York, murdered (so history relates) by their uncle's order. Bones of two youths were discovered under a staircase in the White Tower in 1674. A preliminary of that crime was the summary execution of Lord Hastings, principal minister of the late king, and the loyal adherent of his sons. "Talk'st thou to me of 'ifs'? Thou art a traitor! Off with his head! Now, by Saint Paul, I swear I will not dine until I see the same." Thus Shakespeare, following the chronicles nearest the event related. 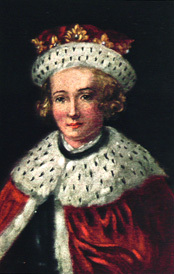 Within two months of Hastings' execution, there was no longer an Edward V. to be crowned, after the manner of his ancestors, in Westminster Abbey. The Duke of Gloucester, presently to become Richard III., was the youthful Edward's guardian, appointed Protector by the Council. "James Tyrrel having devised that they should be murthered in their beds and no blood shed... Within a while they smothered and stifled them; and their breaths failing, they gave up to God their innocent souls into the joys of Heaven." Their "murtherers" buried them at "the stair-foot, meetly deep in the ground." Thus Holinshed, who adds that Richard gave James Tyrrel "great thanks," "and (as men say) there made him knight."